The recipe really could not be any more simple. 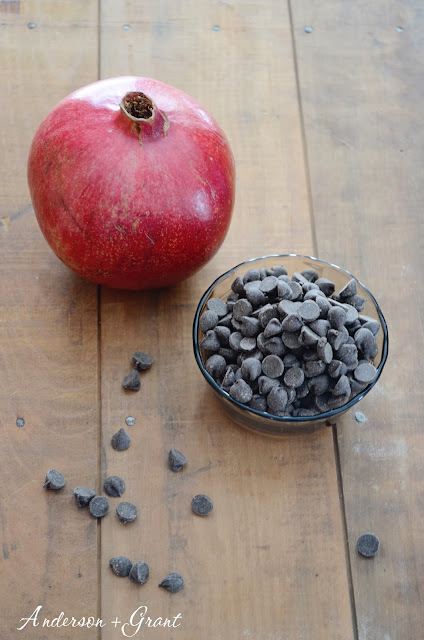 You need two ingredients....a pomegranate and one cup of chocolate chips. I prefer Hershey's dark chocolate, but you can use milk chocolate or semi-sweet chocolate as well. Cutting and seeding a pomegranate can be a little tricking. These links will take you to a couple great tutorials with pictures for cutting and seeding the fruit. Some tutorials tell you to seed the pomegranate in water. I've done it both in water and without water and must say that I prefer to do it without water. Just make sure you wear gloves either way because the pomegranate juice will stain your hands. The chocolate can be melted in the microwave, but I have found that it is easiest to do in the oven. Preheat your oven to 190 degrees and then turn it off. Place your chocolate chips in a baking dish and put it in the oven for about 20 to 25 minutes. Take the baking dish out and stir up your chocolate. If it isn't quite melted put it back in for a few more minutes. 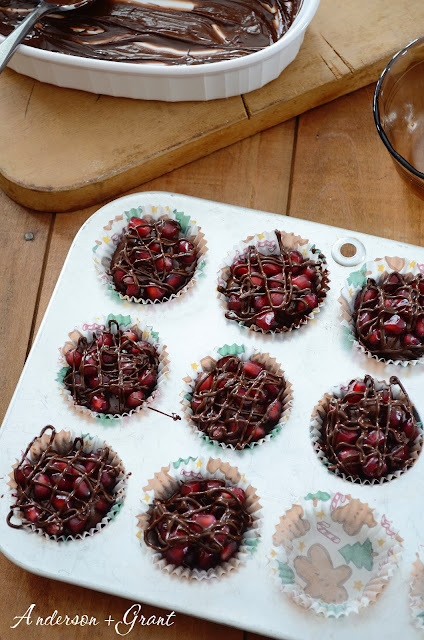 The arils (seeds of the pomegranate) must be COMPLETELY dry before putting them in the chocolate. After patting them with a paper towel, you can leave them out on a paper towel lined pan for a couple of hours to dry. Or you can put them in the oven with your chocolate. 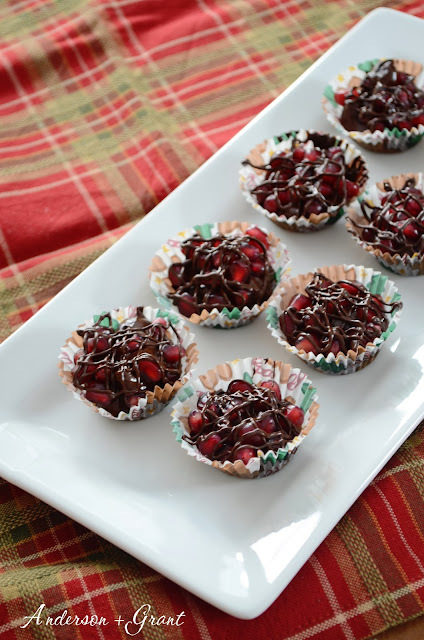 While you are waiting for your chocolate to melt and your arils to dry, line a mini-muffin tin with paper candy cups. When the chocolate is done, add some of it (about 1/3 of the chocolate) into a ziploc bag. Trim a tiny corner of the bag with scissors.....you're going to use this to drizzle chocolate over the top of the candy. 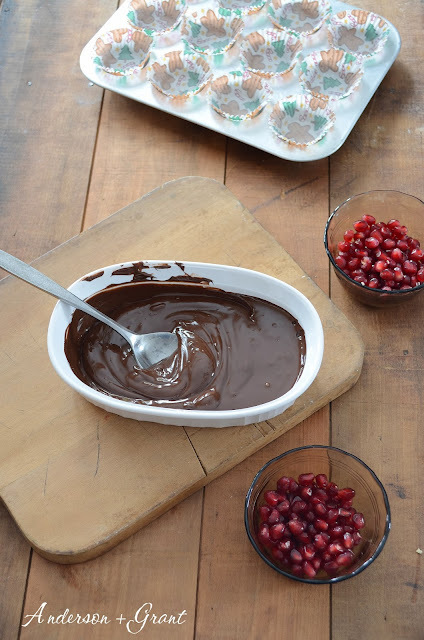 Add half of the arils to the remaining chocolate in the baking dish and mix the two together. 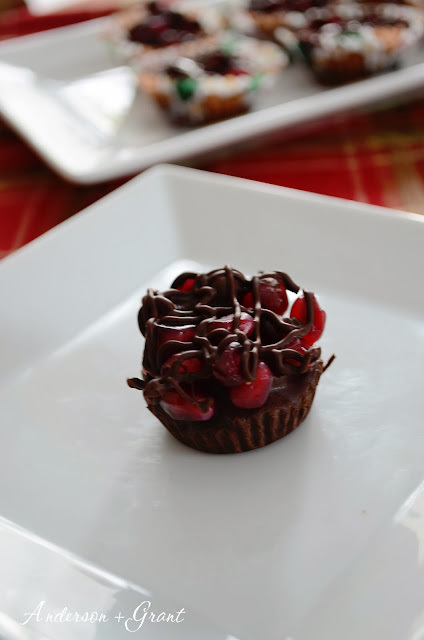 Put a small spoonful of the chocolate mix into the muffin cup, sprinkle some of the loose arils over the chocolate, and then drizzle chocolate over the top with your "pipping bag". Let the candy sit in a cool place until it is hardened. Store them inside a container in a cool place. 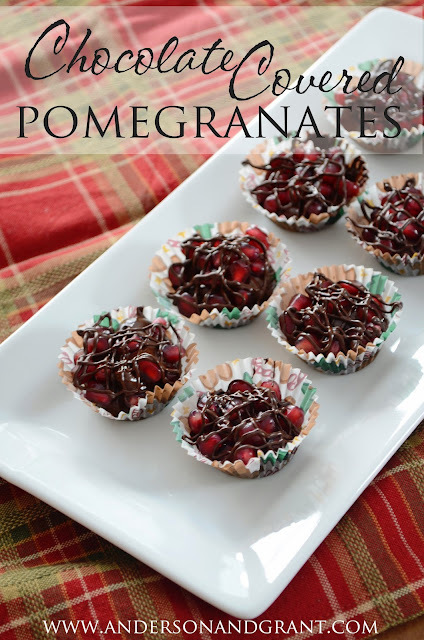 Pomegranate seeds to do not last long outside of the refrigerator, so you'll want to eat these within a couple of days. The recipe will make about 2 dozen candies. This time when I made them, I actually only used half of the arils and put the other half in the freezer and will make the candies again soon.